Raitas and kachumber have a special place in Indian cuisine, especially when served with pulaos, biryanis and parathas. These healthy raitas are made using low-fat curds and other ingredients, which are not only low in calories but also provide other important nutrients to stay fit and healthy throughout. These kachumbers and raitas are perfect accompaniments for a healthy meal. This hearty curd preparation is filled with colour, flavour and nutritional goodness. The low fat curds provide the much needed essential nutrients like calcium and protein. Serve chilled to relish all the flavours. A chatpata salad spiked with cumin and chilli powder. Vitamins A and C are the two important nutrients provided by this spicy kachumber. Serve it chilled with Dhan-Saak Dal, and Brown Rice, to complete a full meal on a lazy afternoon. Carrot and Beetroot Raita, making it look rather cute! Adding carrot further enhances the vitamin A content of the raita and the careful use of spices gives a distinctive Indian feel to it. 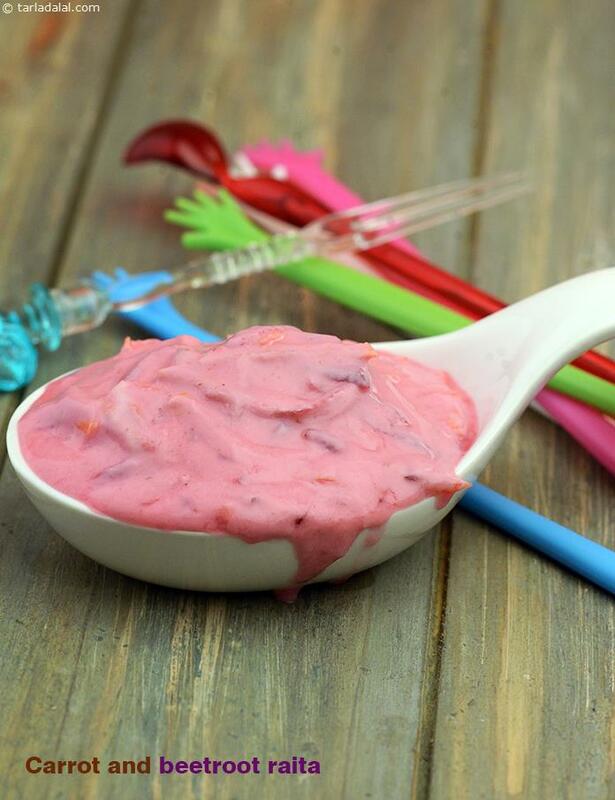 This delectable calcium laden raita is made in a jiffy and is nearly fat-free. Here's an easy way to have a healthy accompaniment to your main course. Barley has been used to enhance the fibre content and sweet corn gives a crispy texture to the salad. The red and yellow capsicum and spring onions add colour to the dish and make it extremely appealing to the eye. A rich and luscious raita with a variety of ingredients. The peppy taste of coriander and green chillies complements the crunchy feel of peanuts and coconut in the beetroot, cucumber and tomato raita, while a tempering of cumin seeds and asafoetida gives out appetising whiffs!